Maintenance is a necessity for almost every aspect of our lives, especially when it comes to our homes. Regular checks of our heating, water and electrical systems ensures these expensive necessities continue to work properly and to catch major problems in their early stages. Just think about how common it is to have your car serviced once a year or so, just to make sure everything is ok. Well, your automatic garage door is no different. With so many components and moving parts involved in its operation, regular maintenance is a must in order to ensure this expensive piece of machinery is able to work smoothly for as long as it can. Garage doors are huge and heavy. This also makes them quite dangerous. Certain factors like warped tracks or worn springs can result in your door getting stuck or slamming shut unexpectedly. When the latter occurs, anything and anyone in the immediate vicinity is in danger of being crushed. Regular maintenance will diminish this risk and also identify any problems that need urgent attention. Since your garage door is one of the biggest access points to your home, making sure it stays in a great condition is vital. 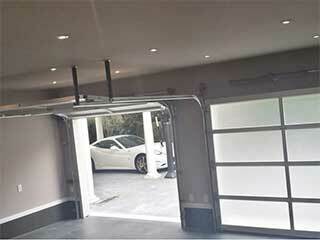 One of the most obvious benefits of regular garage door maintenance is a monetary one. As we mentioned earlier, your door is a collection or different parts, and when one of its components is not functioning properly, it is only a matter of time before other parts start to malfunction as well. Regular service checks and tests will spot these issues early on, and keep them from growing into something worse. This will effectively save you money in the long run, not to mention prevent potentially dangerous scenarios from occurring. You should never try to performing anything like broken spring replacement or track alignment by yourself, as these tasks require professional skills. However, there are some checks and tests you can perform by yourself. For example, you can examine the springs and cables and make sure their condition isn't getting too worse for wear. You can also test the opener safety sensors by placing an object under the door and ordering it to close. If the panels touch the object, the photo-electric eyes could have gotten misaligned. Realigning them is a delicate process, so it's best left to the experts. Contact our team at Garage Door Repair Puyallup today for more information.